A celebration of family, friend and lovers of aviation and we are very excited. Various aviation related groups will be represented. founding in 1918 along with other WWI aviation artifacts. - Helicopter and Airplane rides will be available. - The Epps Flyer will be here on static display along with an engine. - Local vendors selling there wares. - The American Legion will be here it is their 100th year. - Taylor Welch will be performing live music from 3 PM -5 PM. - The Americus Fire Department as well as the Sumter County Fire department will have a truck here and will be giving out treats to the kids. - The Georgia Forestry Fire Bomber will be here and will put on a demonstration for us. - The Sumter Humane Society will be on hand with some cuties. - South Georgia Tech will be setting up a display and we will have the Stearman from the school on display. - Middle Georgia is bringing a couple of aircraft. - The Civil Air Patrol will be here. - We are expecting several transient aircraft for the fly in as flyers advertising the event were sent to just about every airport in Georgia. 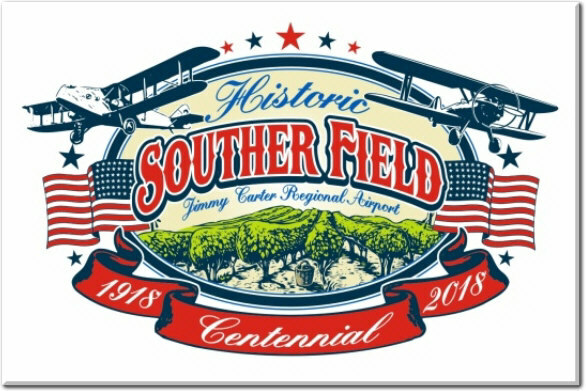 - From local inventory of aircraft we will have out for the public to see: 1940 Luscomb, Kit Fox, Sukhoi SU 29, Taylor Craft as well as a Souther Field Aviation Ag plane ( meet your local crop duster). - Memorabilia will be on display in the airport conference room. - T-shirts with the event logo will sold. Global Graphics is also one of our advertisers/sponsors who support this website.